Treat your chameleon like the king he is! 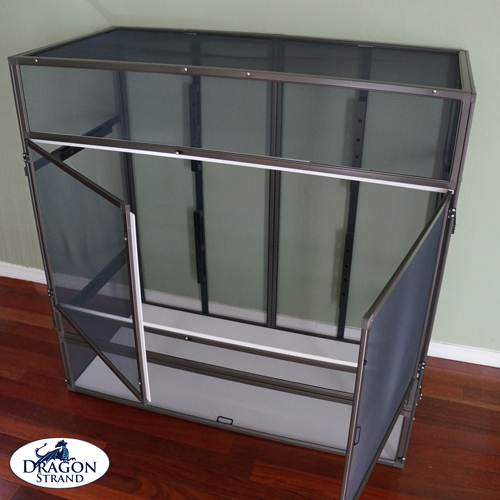 The Dragon Strand Large Atrium Enclosure is designed to be the perfect lifetime cage for a Panther, Veiled, or Jackson’s chameleon. Now you have the space within the cage to create microclimates and a varied landscape. The enclosure comes with a total of eight dragon ledges ensuring that, even in this large format, you will be able to install horizontal branches and mount potted plants. 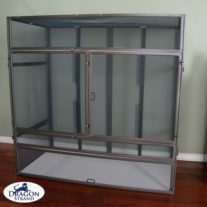 The main door is a double door giving you access to the entire cage while the flip up service door allows the floor panel to be removed for cleaning. The Large Atrium Enclosure measures 45.25″ wide x 44.25″ high x 22.25″ deep. 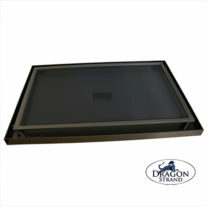 A Drainage Tray is available for this enclosure. 1. Rust Proof. This cage is made to the Dragon Strand standard of no rusting parts. 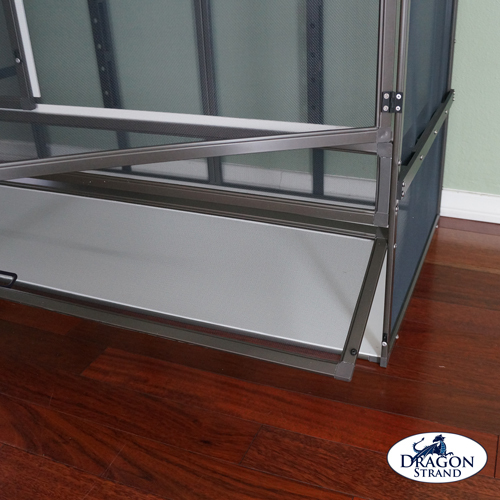 Dragon Strand were the first of the presently commercially produced cages to be able to claim this. I use my cages outdoors and customers come to me for cages to be used in greenhouses. Rust free is not a fluff feature here. It is a basic requirement. 2. Dragon Ledges. 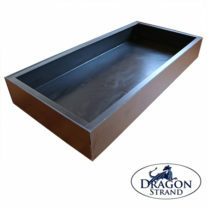 Patent pending Dragon Ledges are included standard which allows ample surfaces and nooks for you to anchor branches and potted plants. These provide the tools for you to create a floating landscape for your chameleon to live and thrive. A lush canopy with a floor clear of obstructions is now possible. Each side panel has two horizontal Dragon Ledges and each of the two back panels have two vertical Dragon Ledges. In total you have eight anchors spread throughout the enclosure for you to create a beautiful interior. The side panels and the two back panels have two Dragon Ledges each giving you ample anchors for your branches and potted plants. 3. Double Doors. 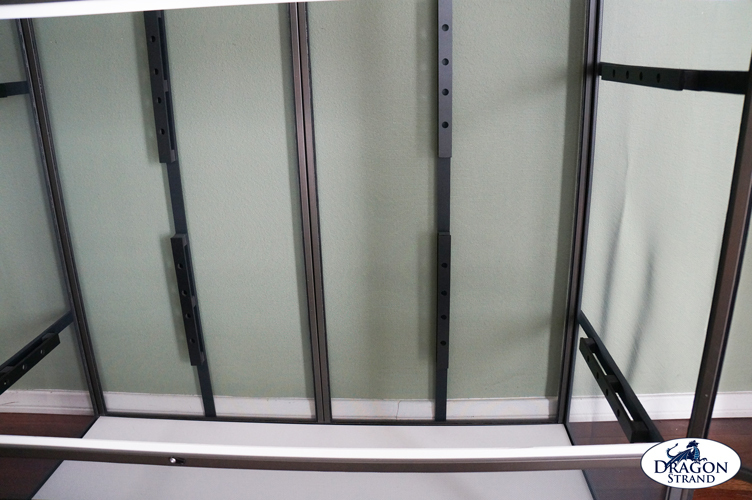 A French door design gives you access to the entire cage width. The right door is the main door, but when more of the enclosure needs to be accessed, the left door is easily opened. 4. Service Door. The flip up service door on the bottom allowing the floor panel to be removed for cleaning is fully functional. The floor is one piece and the flip up service door is as well! The Large Atrium Enclosure ships unassembled.